Earlier this month, the Commercial Drive BIA starting distributing a bizarre and biased survey to the 750 shops, cafes, and restaurants along The Drive, under the guise that they were gauging their members’ support for a proposed protected bike lane on the historic high street. It contained a number of misleading and inaccurate statements – phrased as questions – which sparked an important and productive discussion in the community in the following days about building safer streets. While we like to think common sense will prevail, and the merchants and residents will reach a consensus on a Commercial Drive for everyone, during that process, we watched the same fallacies come up again and again. So based on our observations of that (sometimes heated) debate, here are six paradigm shifts needed to build more livable and equitable streets in Vancouver, and in cities around the world. We’ve written at length about the damaging way that many North American cities shape their infrastructure, policy, and marketing around the commute to work. We agree that getting more people out of their cars and riding a bike to work is great. However, what about the dozens of other trips a person makes in a day? Most families will need to go to the store at some point throughout their week, be it for a full grocery shop or just to pick up a carton of milk. Not to mention meeting up with friends for dinner, taking kids to programs, or any other number of activities Vancouverites spend their time doing when they’re not sat behind a desk. And cargo bikes are making those multi-purpose, utility-based trips a much easier proposition. When we switch from a mindset of commuting, to one that places import on cycling as a means of transportation for other daily errands, it quickly becomes apparent that we are falling behind in encouraging the average person to ride to the nearest market or restaurant. 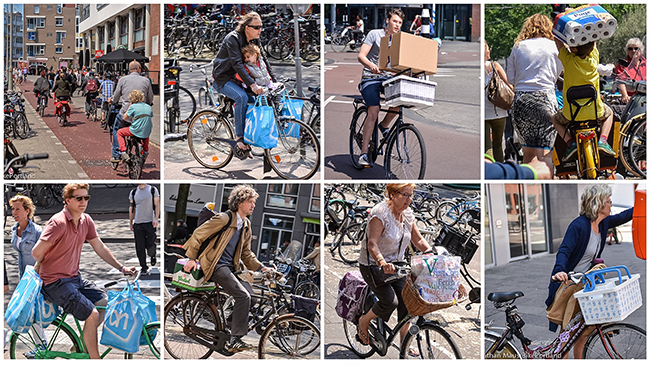 Once we realize that, it becomes very easy to make the case for bike lanes on high streets – the places people actually go outside of office hours. As a by-product of decades of engineering streets to allow for maximum traffic flow rather than pleasure or safety, many now view our historic high streets as thoroughfares instead of destinations. But if you examine the streetscapes, there are countless businesses whose main goal is to get you to stop and spend money. When behind the wheel of a car, travelling upwards of 50 km/hr, people see the world through a windshield, and therefore don’t focus on the shops they are racing past. By returning to a pre-1950’s mindset, high streets can become destinations where neighbours connect, and spending at local markets and shops increase. Relationships are built, and the idea of a well-knit community becomes a greater reality. This outlook increases the quality of life for the residents throughout the area, and increases the dollars that stay in local merchant’s pockets. We’ve seen this recurring theme in cities around the world, which may be the biggest mental block for businesses opposing better transit and bike infrastructure. The simple fact is this: every person has a wallet, but not everyone owns a car. 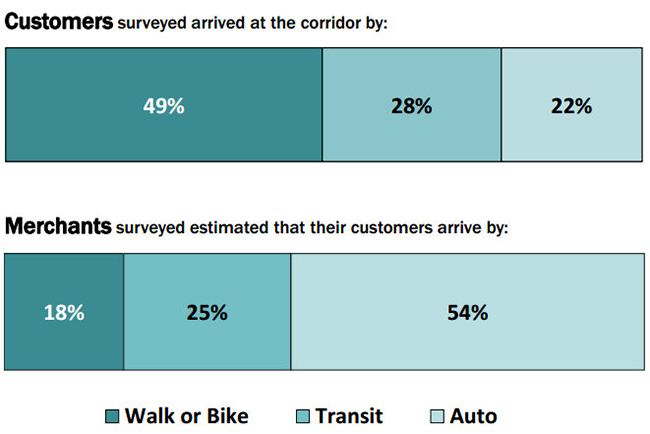 Businesses continually underestimate how many of their customers arrive by foot, bicycle, or public transit (as the above chart illustrates on San Francisco’s Geary Boulevard). 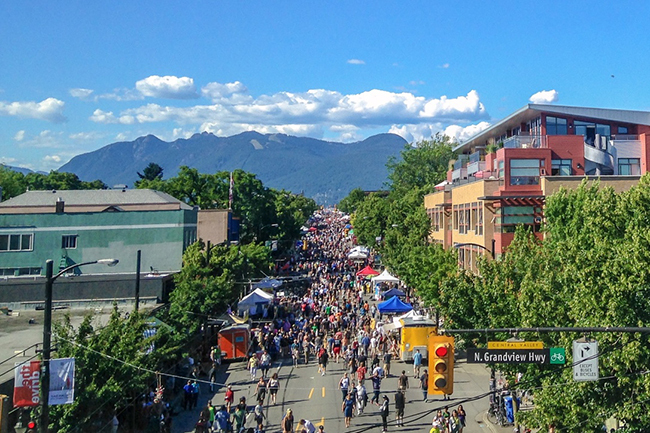 In the case of streets like Commercial Drive, Main Street or even W. 4th Ave, much of their retail dollars come from locals that choose to spend their money where they live, and celebrate the fact that they are in such close proximity to some fantastic local markets, shops, cafes and restaurants (as demonstrated by Slow Streets). 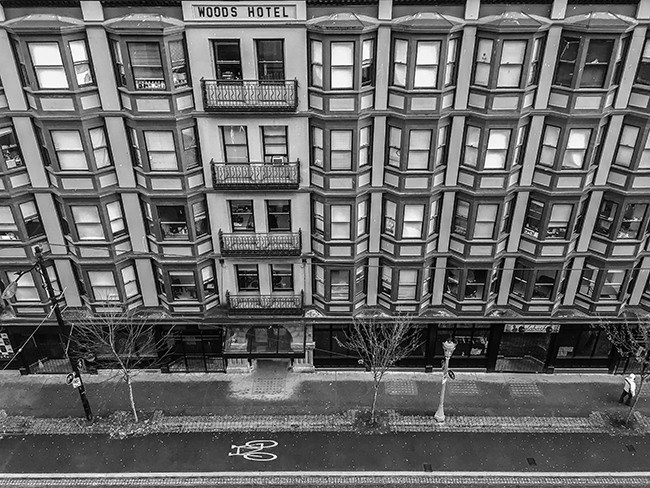 By initially building a network of bikeways on quieter residential streets, Vancouver did itself no favours moving into the 21st Century. Relegating bikes to backstreets only reinforces the idea that they are built for commuting and recreation, and not transportation. But results from other cities like Portland and New York have proven that bikes bring business. The Downtown Vancouver Business Improvement Association has changed its tune on Hornby and Dunsmuir Streets, which makes a very good case for prioritizing bikes on main streets elsewhere across the city. Some Business Improvement Associations make a false presumption that removing a few parking spots for a protected bike lane may cause a drop in retail sales. If they are truly concerned about the bottom line, they must better understand how many of their customers’ wallets arrive there by foot and bicycle, and start to better value those people, and prioritize ways to get them comfortably to their front door. Far too often, we see this discussion centred on the people currently riding bikes. Our mantra at Modacity is: “Don’t design streets that make the 5% already cycling marginally safer. Build them to entice the other 95% onto their bikes.” The latent demand for protected bicycle infrastructure in our cities is palpable, and can be felt every time you talk cycling to someone who doesn’t, but would like to give it a try. If Vancouver’s downtown protected lanes have proven anything, it’s that if a city provides comfortable places for its citizens to ride, then the types of people using them will change dramatically. What was once the domain of fearless bike couriers and Lycra-clad road warriors is now a space shared by people of all ages and abilities – especially families with young children – who are grateful to be able to travel conveniently with their most precious cargo into the heart of the city centre. 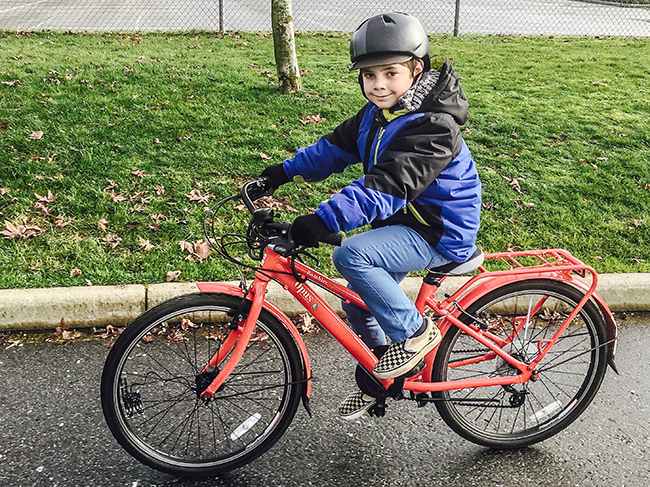 Nearly a million tourists hop on bikes in Vancouver every year, and – as we wrote last year – better bicycle infrastructure is helping them (and their wallets) to venture outside of the downtown peninsula, and into neighbourhoods they wouldn’t ordinarily travel. We’ve heard time and time again from visitors that they love the vibrancy of Vancouver’s streetcar suburbs such as Mount Pleasant and Commercial Drive, but often they wouldn’t have visited there if not coaxed by locals like us. Imagine the tourism dollars that could spread from downtown and out to our many treasured locally owned businesses if we made their trip as safe and pleasant as riding along the downtown bikeways. 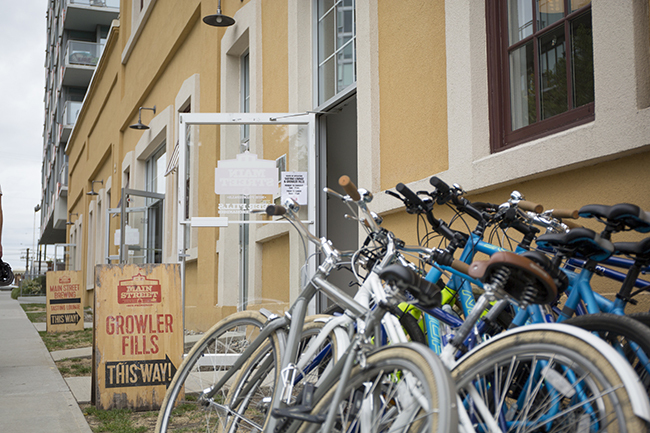 The craft breweries figured out long ago the benefits of attracting tourist dollars, many of them coordinating with tour companies to include them on the route. If those resourceful entrepreneurs can benefit from tourists, so, too, can the countless local neighbourhood favourites, maintaining their feasibility in an increasingly competitive and difficult retail industry.